Below you can review our Step-By-Step PDF and Video guides for installing and configuring SCUP 2011 as well as migrating from SCUP 2011 to the latest SCUP (6.0.278.0) released March 28, 2018, by Microsoft. Note: The guides below are for the SCUP Catalog only subscription. If you purchased our automatic publishing service, please use the publishing service setup guides. Step 1. This PDF and Video step by step guide will walk through the installation and configuration of SCUP 2011. If you already have SCUP installed and configured, skip to the “Catalog Subscription Setup Guide”. This guide includes installing the MSI, connecting SCUP 2011 to WSUS and SCCM, creating a self-signed certificate (PKI SCUP Certificate Guide Here), deploying the certificate to clients, and enabling the “Allow signed updates from an intranet Microsoft update service location” group policy setting. Step 2. This PDF and Video step by step guide will walk through the process of adding our Patch My PC SCUP Catalog into SCUP 2011. This guide includes adding the catalog URL into the catalogs node of SCUP 2011, importing the catalog to load all updates, subscribing to our SCUP Catalog release newsletter, and subscribing to our SCUP Catalog release RSS feed. Step 3. This PDF and Video step by step guide will walk through the process to publish Patch My PC SCUP Catalog updates with SCUP 2011. 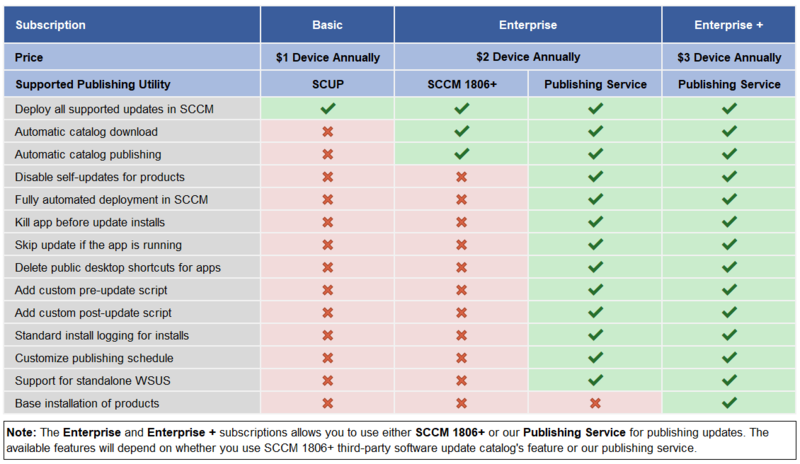 This guide includes publishing updates and what the content types (Full Content, Metadata Only, and Automatic) mean, monitoring the synchronization process between WSUS and your SCCM software update point, enabling the third-party applications in the software update point products, and verifying updates are synced into SCCM. Step 4. This Video step by step guide will walk through the process of deploying updates that have been published with SCUP 2011. This video guide will show how to can add the published third-party updates into a software update group and deploy them in SCCM. Step 5. This PDF and Video step by step guide will walk through the process to publish and remove old expired updates from SCUP 2011. This guide includes publishing expired updates to WSUS and then removing those expired updates from SCUP.